by Cohen, Barbara, Jones, Jan N.
Cohen, Barbara, Jones, Jan N.
Make a Wish, Molly Barbara Cohen Illustrated by Jan Naimo Jones Molly and her mother don't know about birthdays. 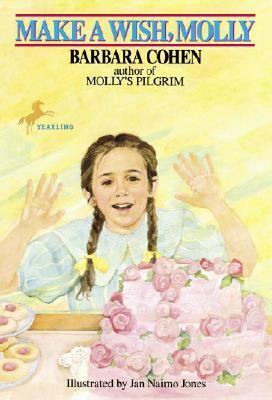 In Russia they didn't celebrate birthdays the way they do in America When her new friend from school sends her a birthday party invitation, Molly can hardly wait. The party is during the week of Passover. Molly can't believe her bad luck. She knows she shouldn't eat any of the pretty pink cake. The frosting looks so good and her mother would never know. Then something happens at Emma's party -- something that Molly won't ever forget.Cohen, Barbara is the author of 'Make a Wish, Molly ' with ISBN 9780440410584 and ISBN 0440410584.